The Indian girls proved sensational performance in the second competition day of the Cologne Boxing World Cup in Germany where the quarter-finals were in the official program. Pinky Jangra Rani, two-time AIBA Women’s Youth World Champion Sakshi Choudhary and another teenage talent Parveen all won their contests on Day2. China’s top female team will be attending in the ASBC Asian Confederation Women’s Boxing Championships in Bangkok next week but their second squad is enough strong also to win key contests. Their National Champion at the welterweight (69kg) Yang Liu felt the tempo better than Ireland’s Nanjing 2014 Youth Olympian Christina Desmond and led 10:9 after the first round in each scorecard. The Chinese boxer found the best angles during her attacks and eliminated Desmond who returned to our sport after her injuries. Thailand’s Wuttichai Yurachai won the gold medal at the strong Galym Zharylgapov Memorial Tournament in Kazakhstan last December and he continued his winning path also in the Cologne Boxing World Cup. His opponent was another Asian talent Zhang Jiamao who claimed silver in the last edition of the Chinese National Championships. The Chinese boxer had longer reach but he attended in his first international competition and his lack of experiences was not enough to beat Yurachai in Cologne. The technician Thai boxer controlled mainly the second part of their contest and marched into the last four of the Cologne Boxing World Cup. Thailand’s Chiranchaya Phunsang claimed bronze medal at the Taipei 2015 AIBA Women’s Junior World Boxing Championships and her skills developed dramatically in the recent one and half year. The 20-year-old boxer eliminated multiple international tournament winner Romania’s Claudia Nechita as first on Day1. She had to meet in the quarter-final with India’s Pinky Jangra Rani who was quarter-finalist in the New Delhi 2018 AIBA Women’s World Boxing Championships. Rani’s left-handed hooks were dangerous for the Thai boxer in the first round and she looked faster than Phunsang. The Indian boxer used up all of her experiences to beat her promising Thai rival in Cologne. India’s Sakshi Choudhary won the Taipei 2015 AIBA Women’s Junior World Boxing Championships, the Guwahati 2017 AIBA Women’s Youth World Boxing Championships and the Budapest 2018 AIBA Women’s Youth World Boxing Championships. The super talented teenager met with Denmark’s Cecilie Koelle who is also new in their elite national team. 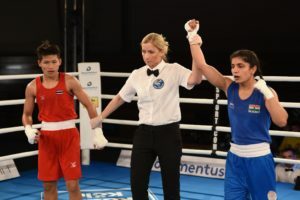 The Danish boxer stepped into the best fighting range of the Indian teenager several times therefore Sakshi could win all of the rounds in their meeting. 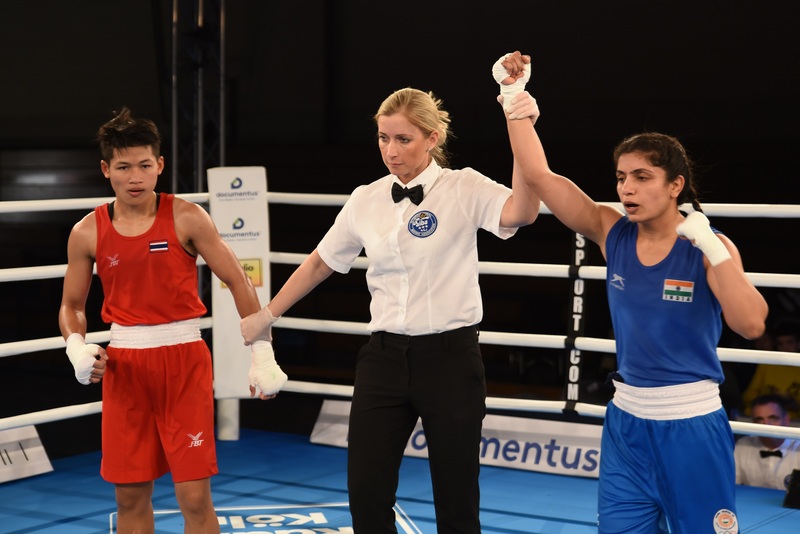 India’s Parveen is Youth National Champion but she did not receive the chance to attend in ASBC or AIBA events yet. The lightweight (60kg) boxer was born in 2000 and she is now elite since January and the Cologne Boxing World Cup is her first challenge. The Indian boxer felt the rhythm well in the first round against Germany’s Anne Marie Retzer and landed clear jabs. Parveen will be turning to 19 only later this year but she worked professionally against her local opponent and advanced to the last four in Cologne. Thailand’s Wuttichai Masuk is Incheon 2014 Asian Games winner, ASBC Asian Champion and earned bronze medal at the Doha 2015 AIBA World Boxing Championships. Masuk returned in the Cologne Boxing World Cup with his best performance and following his first fight against Germany’s Murat Yildirim he continued his tough winning path. Thailand’s pride had to meet in the quarter-final of the light welterweight (63kg) with Denmark’s Frederik Lundgaard Jensen who has the same long distance style as Masuk. The Thai star moved ahead more and he wanted to fight this time against Denmark’s No.1. Masuk was better in that game and secured his place in the last four.